The newest robot in Japan helps to save the environment by sorting plastic using lasers. This will allow for more than 45% of the total household plastic used to be recycled rather than burned. Mitsubishi, IDEC, and Osaka University have teamed up to help with Japan’s recycling problems. They’ve built a 1.7m x 2.1m (5’6″ x 6’9″) robot that sorts plastic using lasers. In Japan, only about 13% of plastic (PET and PS) is recycled. The new robot would be able to sort six different plastic types, including PE and PP plastics which comprise 45% of the total, are not discernible by eye, and which are normally burned with other refuse. With millions of Japanese households generating millions of tons of plastic trash, adopting the robot for use in homes could make a big positive impact on the environment. According to the Telegraph, the recycling bot is undergoing test runs in Osaka and Nara. A smaller version of the robot for home use is under development by IDEC, with a target cost around ¥ 5 million (~$55,000). Ouch! Recycling plastic is just one more chore that robots have conquered on the path to creating a completely automated house. 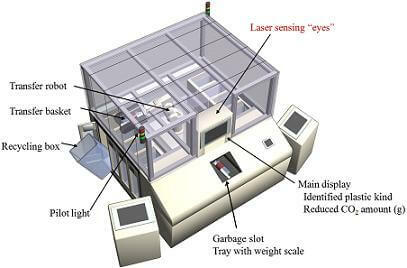 The laser used by the recycling robot was developed by Osaka University’s Photonics Advanced Research Center. It accurately measures the reflectivity of the different plastics to be able to tell them apart. That’s a pretty mundane task for a complex laser system. I wonder if a similar technique would allow robots to eventually distinguish between biological and non biological objects, between different people, or even between healthy and unhealthy tissue. Robots have taken over vacuuming floors, washing windows, and cleaning dishes. Slowly but surely these automatons are checking things off your To Do list. While most household robots don’t have the speed or precision of their industrial counterparts they’re able to handle the more chaotic needs of a family. What may be surprising to our future-looking 1950s ancestors, is that these robots are not humanoid, have no cute personalities, and still require a great deal of human interaction. Some, like a dishwasher, we usually don’t even consider to be robots. While the idea of a Jetsons’ style Rosie may be stuck squarely in the public conscious, it’s the robotic appliances that have shown up in our homes first. We may have to get used to the idea that by the time a humanoid robot comes around, all the real work will have been handled by the non-humanoid bots. That’s okay, let the giant robotic square handle the recycling, the androids and I can go play baseball.